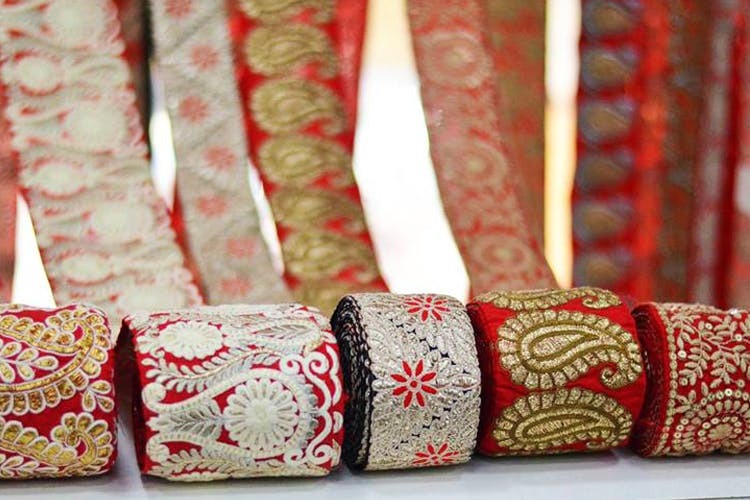 Stop by Finesse Exquisite Laces for borders, tassels and motifs to add some pizzazz to dull sarees, or to create that lehenga you’ve been fantasising about for months! Keen on something that’s unique, one-of-a-kind and (the best bit!) affordable? Finesse Laces is located on GN Chetty Road in T Nagar, helpfully close to all the fabric and saree shops the area teems with – so you can drop by after a big shopping spree to give your purchases a unique twist. Finesse is a wonderland for fabric additions. It is so well stocked, you’re likely to be dizzied by the choices on offer, so come with lots of time on your hands! Buy five and a half metres of plain jute silk, and attach an embroidered border or a kutch work border available in different colours (INR 1,000 - 2,000) for a classy look. Or dress up a plain georgette saree with beadwork borders and pearl lace! They also have multiple other borders — zardosi, lace, delicate sequins on a net fabric, and even some with understated kundan work and thread embroidery. Also on offer are floral and traditional cutwork embroidery borders that cost between INR 1,180 and INR 2,000. The ghagras are usually edged with gold ribbons a big border and then finished with another complementing, thinner border, and you can choose from chunky or subtle add-on decorative lumbas to tuck into the skirt to complete the look. Edge an existing blouse with sequins, dress it up with zardosi buttis that can be stuck on with fabric glue, or some intricate gold paisley motifs and add tie-ups with gold doris (choose from a huge range of these little golden ornaments that hang from your blouses), and you have your very own designer creation!